VietNamNet Bridge - Seventy-five percent of Vietnam’s farm produce is exported to China, but the figure could fall as China grows more of its own food. With a population of over 1 billion, China has to import a large amount of food every year. However, in recent years, the country has expanded farming to become more self-sufficient and reduce imports. China has increased dragonfruit and watermelon growing areas, and has expanded pig farming, while Chinese farmers have flocked to Laos and Cambodia to rent land for agricultural production. According to the US Department of Agriculture (USDA), China’s pig farming is entering a new development period. The number of pigs in the country has increased to 27 million. Chinese farmers are also farming pigs because of a price escalation, reaching $100 per one pig in 2016. 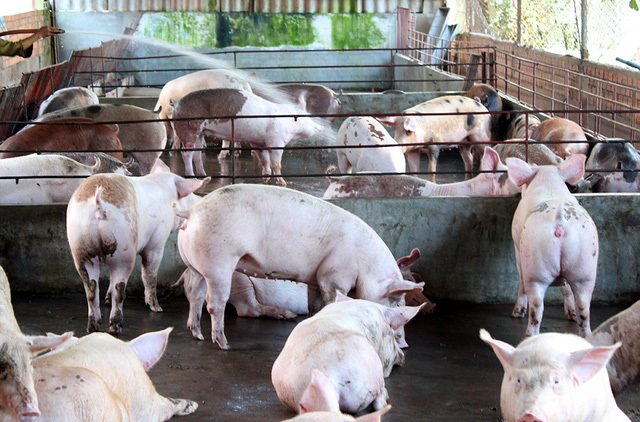 Many modern pig farms have expanded in the northeast of China, which also wants to stimulate grain demand for farming. Some researchers estimate that the output in the northeastern part may reach $120 million pigs per annum. As for watermelon, an MOIT report released in early 2017 showed the steady increase in output in China, from 72 million tons in 2013 to 77.5 million in 2016. The Chinese agriculture ministry plans to increase 2.2 million hectares of watermelon growing area each year in 2015-2020. MARD in 2015 reported that Chinese in Laos and Cambodia rented hundreds of hectares of land there to grow watermelon. More recently, it said that Chinese were also growing dragonfruit in the two countries. Dang Kim Son, former director of Institute of Policy and Strategy for Agriculture and Rural Development, said all countries which import farm produce from Vietnam tend to restructure their agricultural production in the context of climate change, trade war, science and technology renovation, and consumer structure changes. Some months ago, China refused watermelon imports from Vietnam, prioritizing to buy domestic products. Vietnam needs to change production habits to adapt to the new market circumstances. “What Vietnam needs to do is adjust the production to fit the market,” he said, adding that it is necessary to do market research and analysis to connect with new markets and new segments. In general, all countries, including China, cannot be 100 percent self-sufficient and they still need imports. Son said that Vietnam’s farm produce will still be competitive with China if Vietnam can cut production costs and increase quality and safety. China remains the biggest importer of Vietnam’s farm produce, consuming 75 percent of Vietnam’s farm exports.